I was particularly looking forward to the last stop on this edition of the (always fun) bi-annual Friends of Santa Fe Trail Pub Ride. 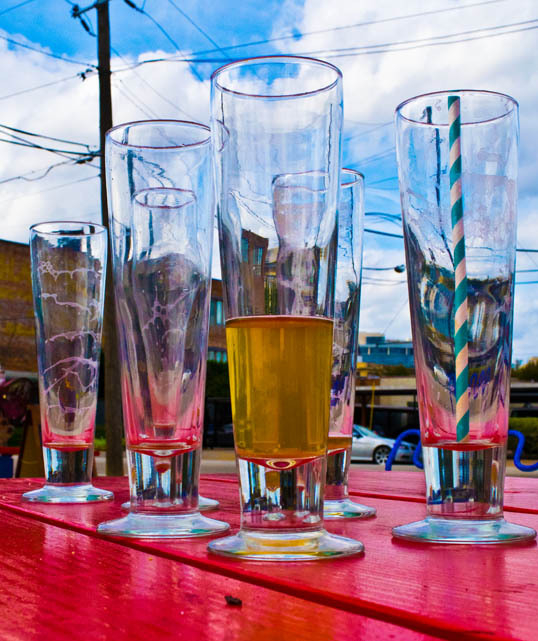 We would be ending up at the (relatively new) spot in Deep Ellum, Bowls & Tacos. This is a spot set up by the fine folks behind another of my favorite spots on the other end of Deep Ellum on Main Street, Braindead Brewing. 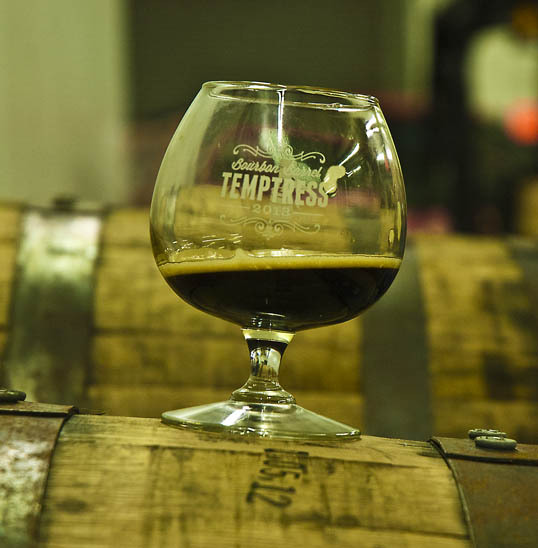 I had heard good things and was suffering from a hankerin’ to get down there and try it out. So today, a group of us Rode the Santa Fe Trail (of course) then visited Local Hub Bicycle Company and Deep Ellum Brewing, before pulling into Bowls & Tacos. It’s in a converted gas station on the East End of Deep Ellum and we appreciated their ample and well-thought-out bicycle parking. 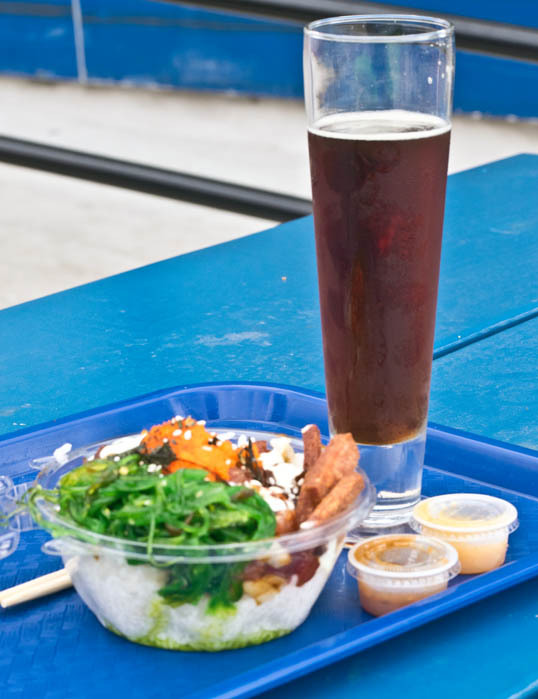 Their menu consists of two things, obviously, Poke Bowls and Tacos. As is my habit when I am hungry, I went with the first item on the menu, The Classic Poke Bowl, with: Ahi Tuna, Seaweed Salad, Sweet Onion, Ginger Soy, Basil, Masago, Crispy Spam, Sesame Seed, Avocado Wasabi, and Nori. It was so good I think it will be a long time before I get over to the taco side of the menu. Not surprisingly, their craft beer selection is excellent and heavy on Braindead Brewery products – I went with their Red. It was all excellent and I will be riding my bike back again. Soon. Want to try some of the other Poke Bowls. Maybe even a Taco. 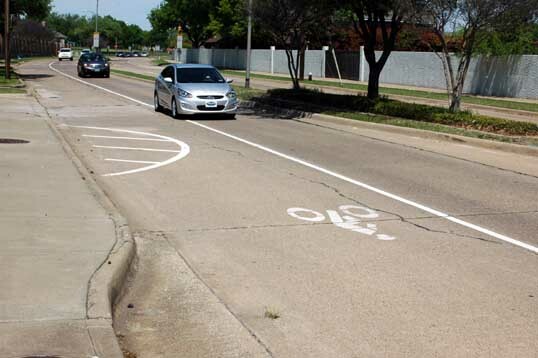 In North Texas there are two slivers of time each year – one in the spring and one in the fall – where the weather is passable for outdoor activities. The rest of the time the air is cold and wet or – especially – deadly hot. Right now, in mid-October, is one of those salad times. 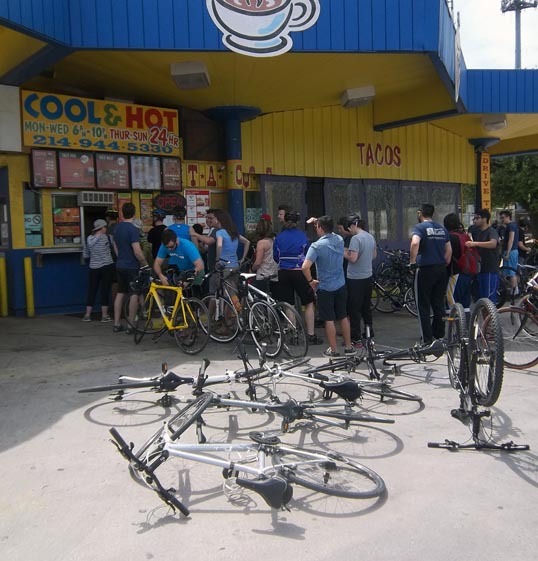 Last spring – April – Bike Friendly Oak Cliff sponsored a bicycle tour of taquerias in their part of the city. I went, wrote about it, and had a good time. 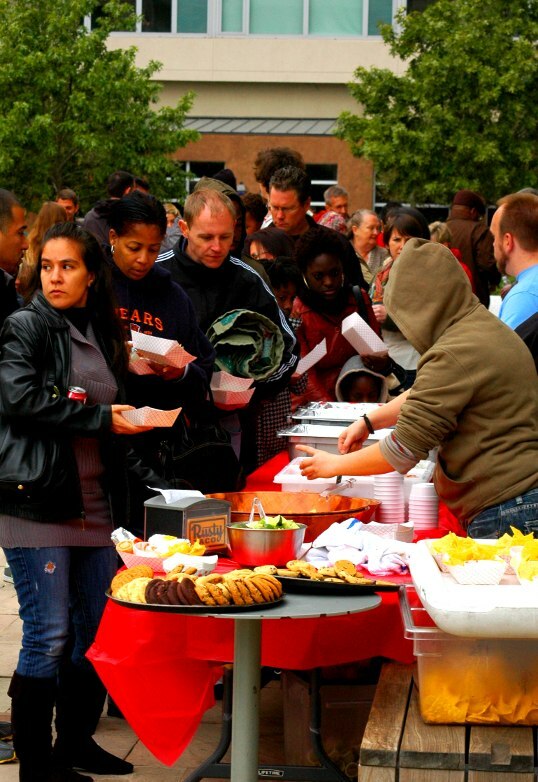 Now, as part of their Cyclesomatic October, a celebration of the nice weather, they were sponsoring a second helping of tour de taqueria. On Saturday I rode in a bike ride where we toured a number of breweries. Luckily, I was careful to not imbibe too much, yet stay hydrated, so I felt good enough to venture forth on two wheels and pedals for a second day in a row. I had been having trouble riding lately and thought it was due to bad hay fever or the ravages of age, but this morning I did some routine maintenance on my road bike and discovered a simple fault I should have noticed (the front tire off-center and rubbing on the fork) and didn’t. I fixed it, adjusted and lubricated everything and was set to go. It made all the difference. However, the maintenance work took up a couple hours and set me, as usual, behind schedule, so instead of taking the train to Oak Cliff I loaded up my car and drove down. One nice thing about driving with a bike is that you don’t have to park close – which helped out in Bishop Arts on a nice Sunday Afternoon. The tour started out at The Wild Detectives – one of my favorite places in the world. It’s a combination bookstore, coffee house, and craft beer dispensary – what can be better than that? 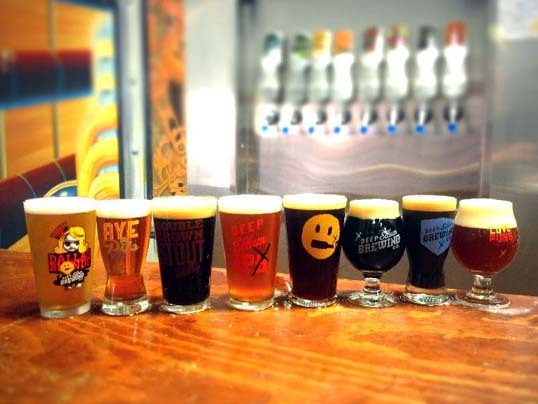 An establishment dedicated to reading material, roasted Arabica beans, and fresh suds on tap… I’m glad it’s a long way from where I live or I would be there all the time. 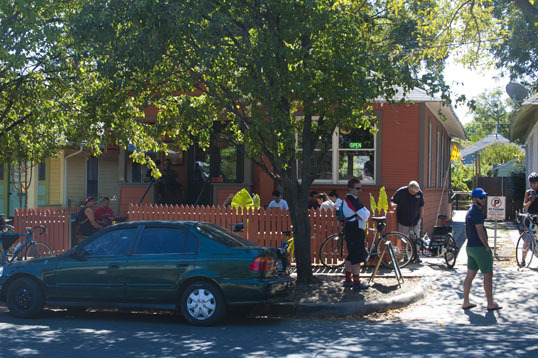 The Taco ride starts at The Wild Detectives in the Bishop Arts District. 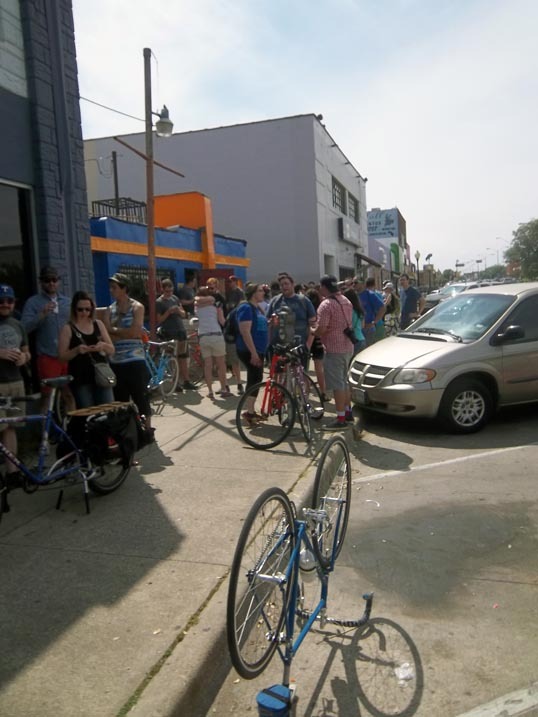 Last time, the taco tour had five stops and a huge crowd. This go-round we only had three taquerias scheduled and a more manageable group – and I was happy for this. 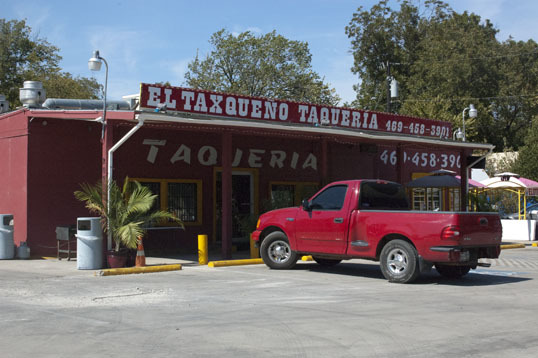 Our first stop was El Taxqueño Taqueria at 207 W. Suffolk Ave – a nice restaurant with indoor seating and a patio. It’s right off Interstate 35 going south of the city – pretty handy. The owners were very welcoming and bike-friendly – I’ll definitely be back. 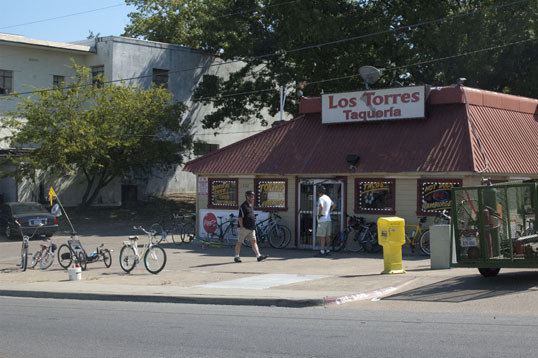 Then we headed west to Los Torres Taqueria at Clarandon and Edgefield. 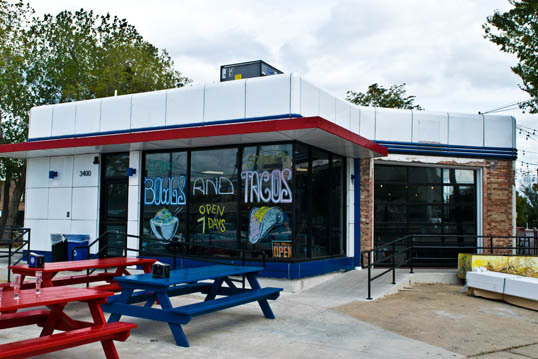 It’s a popular spot that has won best Taco Joint from D Magazine the last two years. It’s reputation is well deserved. After Los Torres we headed north on a long downhill run on Edgefield until we crossed Interstate 30, then turned East to the rapidly developing West Dallas neighborhood off the Margaret Hunt Hill Bridge. We stopped at La Gaviota Taqueria off the Interstate next to the huge postal service station there. I had never seen this place or known it was there, but it too was worth the effort to find and ride there. Now it was time to head back to The Wild Detectives and we had to earn back the downhill coasting. There are some steep heart-wrenching hills in Kessler Park, and we earned our daily tacos fighting up them. A great time. 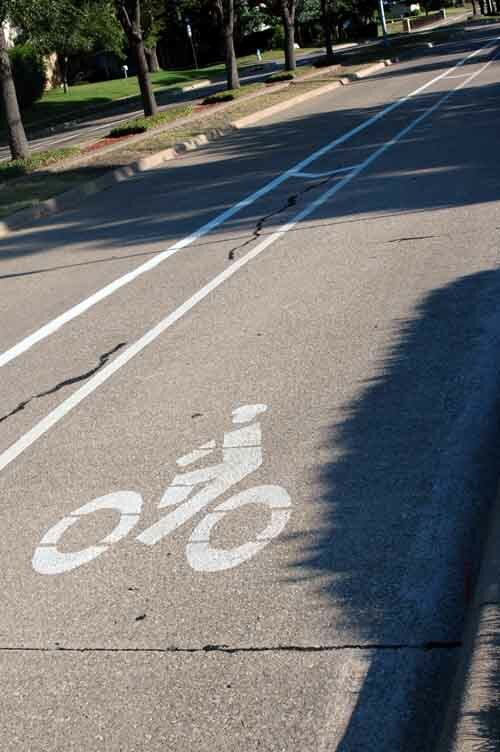 Next week is another bike ride in in Oak Cliff – the Stevie Ray Vaughn Memorial Ride. Be there or be square. 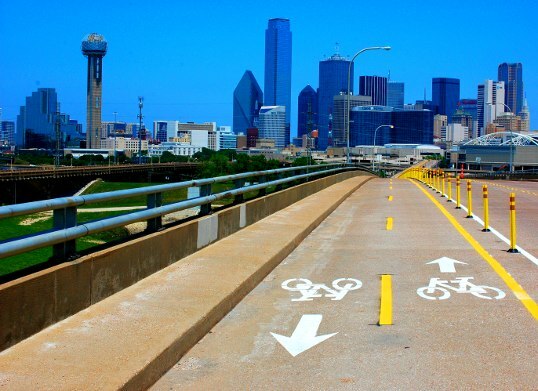 There is nothing better in North Texas than the few spring days when the sun is shining and the day is warm – yet the killer summer heat is still a little off into the future. 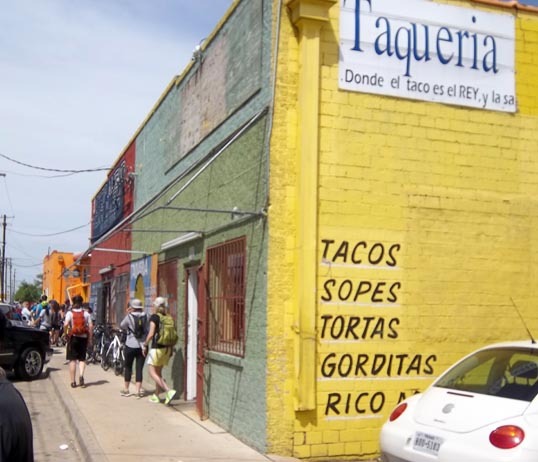 Saturday was one of those days and I headed down to the Bishop Arts District for a bicycle ride – a tour of Taquerias in Oak Cliff. 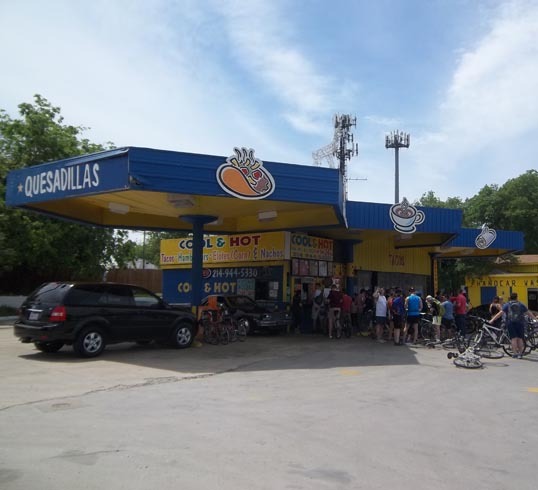 Cool & Hot is a converted gas station right off the Interstate – it’s mostly a drive-thru. It’s open 24 hrs a day from Thursday through the weekend – something to remember on a late night trip home. 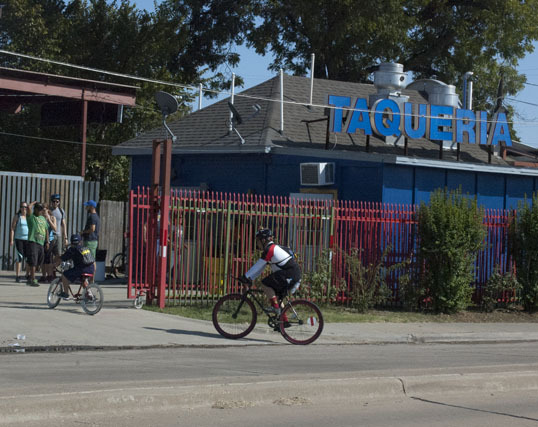 Then is was on to Taqueria Tiquicheo at 110 S. Marsalis Ave. – Streetview. This was my favorite stop on the tour – more of a sit-down restaurant. 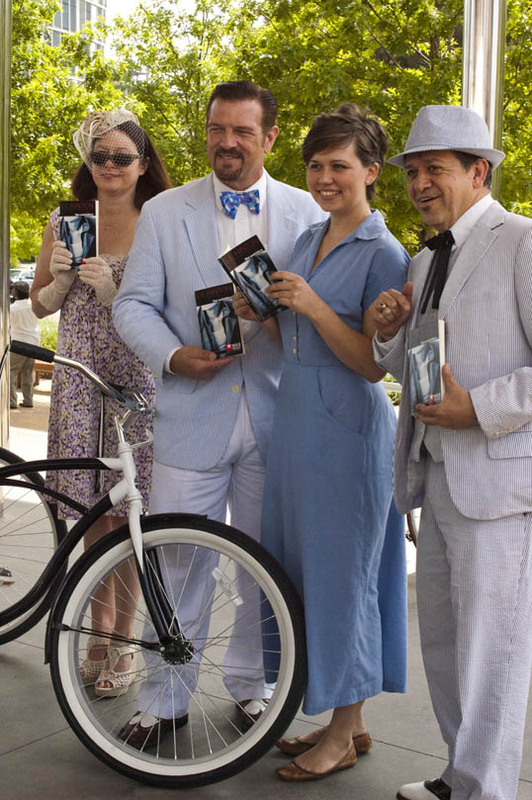 The regulars were there for menudo or other specialties – the sweaty bicyclists descended like a cloud of taco-eating locusts. All the spots offered pretty much the same traditional selection of Mexican style tacos. 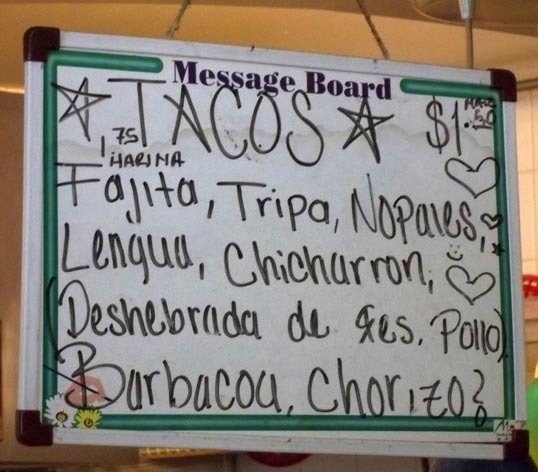 This is the sign from Taqueria Tiquicheo. 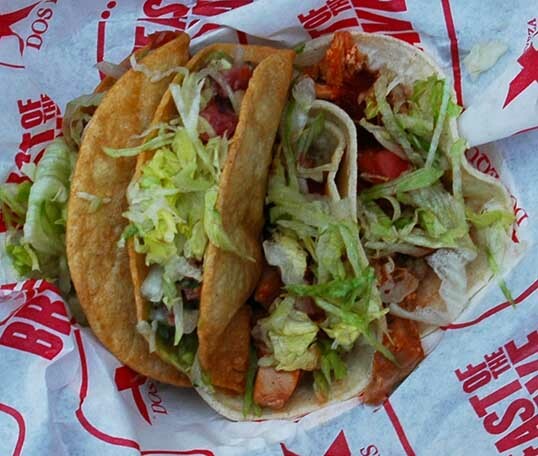 If you think of tacos as hamburger stuffed into crunchy corn shells – well, these aren’t what you are thinking about. Served in foil in soft flour or corn tortillas with a little onion, cilantro, and a lime wedge – along with the house special hot sauces. Next was on to Jefferson Boulevard – the main commercial drag through the area. The next Tacqueria was a very small, unlabeled spot with a small dining room. 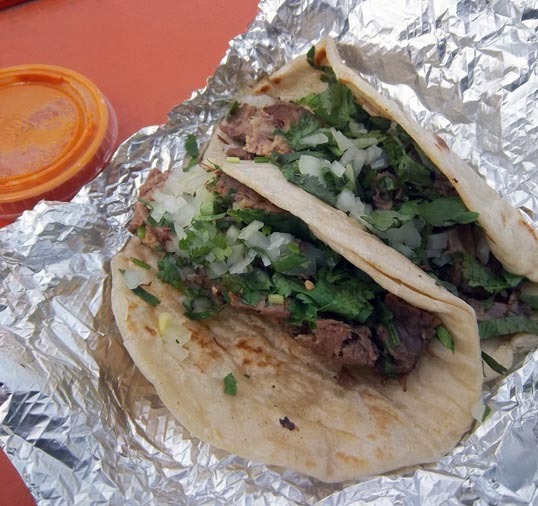 These are the Lengua Tacos from El Padrino – I ate them on top of a newspaper stand on the street. This was the most conventional restaurant that we visited, yet still it had that family feel to it. And that was about all the tacos I could take for one spring afternoon. I split off and rode home – a little overfull and a bit overheated. But it was still a good time. 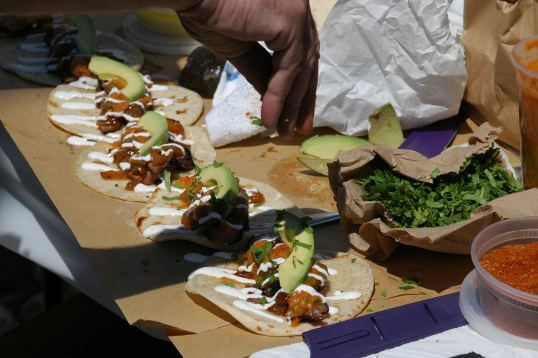 This weekend we were at the North Texas Taco Festival in Deep Ellum. It’s a continuation of the events associated with the Deep Ellum Market (such as the Filipino Fest last year) and the most successful so far. There were a lot of people there. Unfortunately, more people than tacos and the lines were too long (I’ll talk more about that later). But still, it was a beautiful day and a fun time. At the side of the street, next to the Curtain Club, I saw a sign that said, Taco Talk – 1 PM. Looking at my phone, it was about ten after, so we went in. Inside was a lecture put on by three taco experts. It was sort of fun being a couple minutes late because we didn’t hear the introductions and had to figure out who they were by inference. 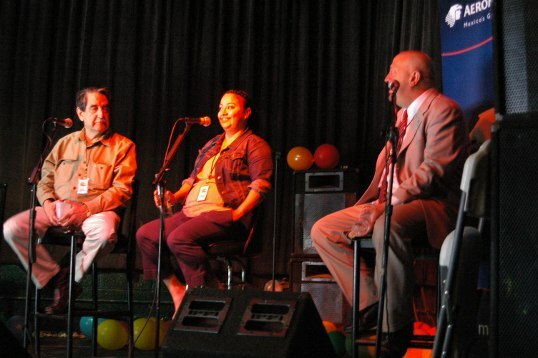 John Cuellar, Anastacia Quinones, and Alejandro Escalante – the panellists at the Taco Talk. I realized that his was John Cuellar, of the El Chico founding family. 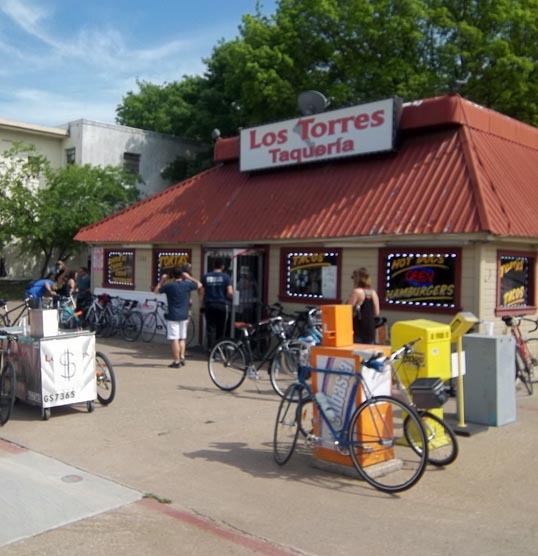 His family sold their chain and now he is responsible for a restaurant in Oak Cliff, El Corazon de Tejas – a place we will have to check out. I’ll let you know about it. 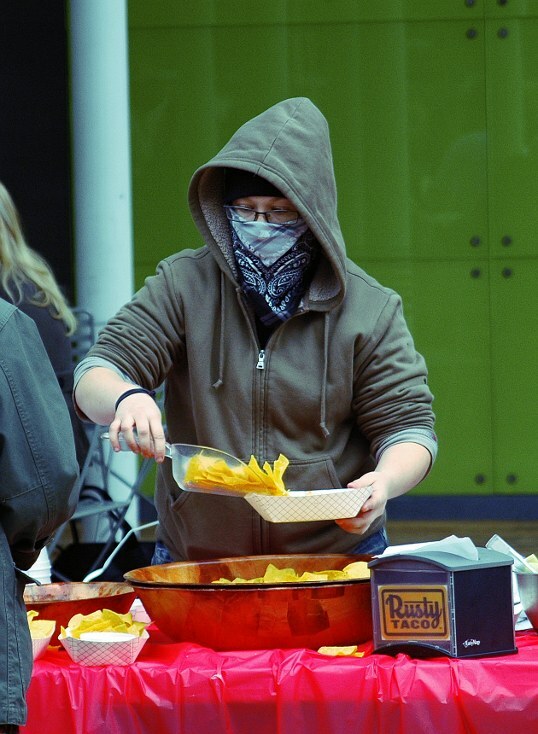 Next to him was a woman that graduated from the CIA and was the representative of the expert culinary aspects of the humble taco – elevated to gourmet heights. 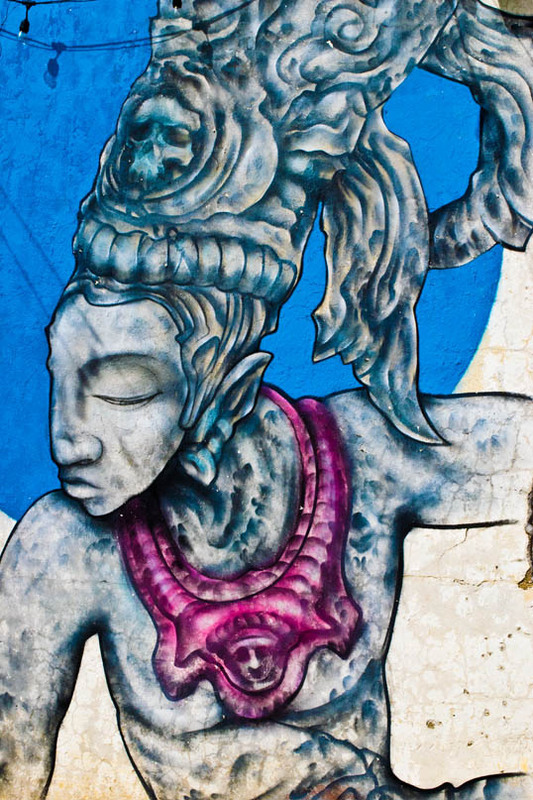 She was Anastacia Quiñones, the chef at Komali. After the talk, we spoke to her for a few moments and she gave us a card and a free appetizer – so… well, another place to go and report. She talked about the wonderful taste of fresh nixtamal. Most tortillas are made from commercial ground cornmeal or processed mix. She said her restaurant was the first in the city to make fresh nixtamal – whole kernel corn processed with lime (like hominy) and then ground fine on a metate each day. All three experts said that fresh nixtamal produces tortillas with a unique and wonderful taste and must not be missed. The third panelist was an expert on all things taco. He was Alejandro Escalante – the author of the book, Tacopedia. He talked passionately about the wide variety of tacos available throughout Mexico and all the variables in tortilla, meat, and salsa that can be used. The depth of his knowledge and the obvious love he had for the form made his contribution something to be enjoyed and savored. One interesting point they made was when they were asked about Mexican Fast Food – about Taco Bell and Chipotle. These are Taco Experts and passionate about quality food and you would expect them to rant and complain about the bland and poor quality of fast food. They did not, however. Mr. Escalante pointed out that Mexican Food, tacos and nixtamal in particular, are an acquired taste and Taco Bell helps people become accustomed to the food style. Ms. Quiñones agreed and Mr. Cuellar used the phrase that occurred to me immediately – that Chipotle is the “Gateway Drug” to real Mexican Food. I thought their attitude to be refreshing and honest. They all three spoke about their first memories of eating tacos and about their “Desert Island Tacos” – what they could not live without. In high school, in Nicaragua, there weren’t really any tacos, so my first real memories of great tacos were from Hutchinson, with flour tortillas filled with ground beef, sealed with toothpicks, and then fried crispy. You would crack them open and fill with lettuce, tomato, and salsa right before eating. They talked about what makes a taco (who knows?) and the close relatives of enchiladas and tamales. I thought about the Nicaraguan Nacatamles – giant savory concoctions layered with masa and served in steaming packets of banana leaves – and how I can’t get them anywhere (although the Salvadoran tamal served in local pupuserias does come close). They talked about the future, about lengua, cabeza, and authentic barbacoa, and about how far can the form be taken. 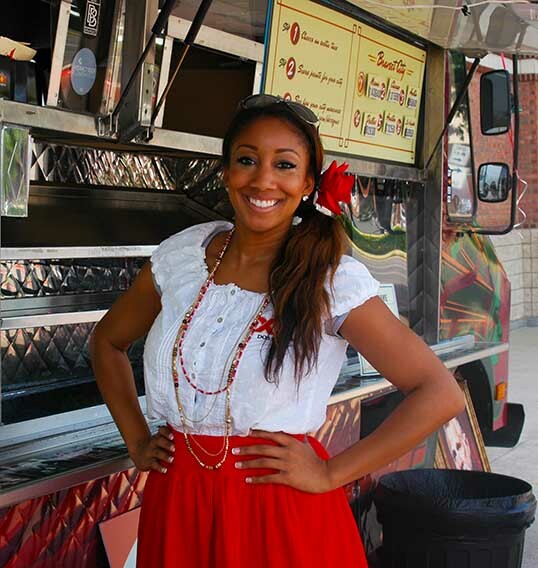 I thought about the Ssahm Food Truck here in Dallas and their wonderful Korean style Kimchi tacos. They even mentioned puff tacos – which were really popular when I first moved to Dallas in the 1980’s. That’s when you take a disk of masa and drop it in oil… and it puffs up crispy, so it can be cracked open and filled. John Cuellar said there was an art to getting everything, temperature, moisture, oil, just right and if you had a sixty percent success rate, you were doing good. It was a very fun and interesting talk. 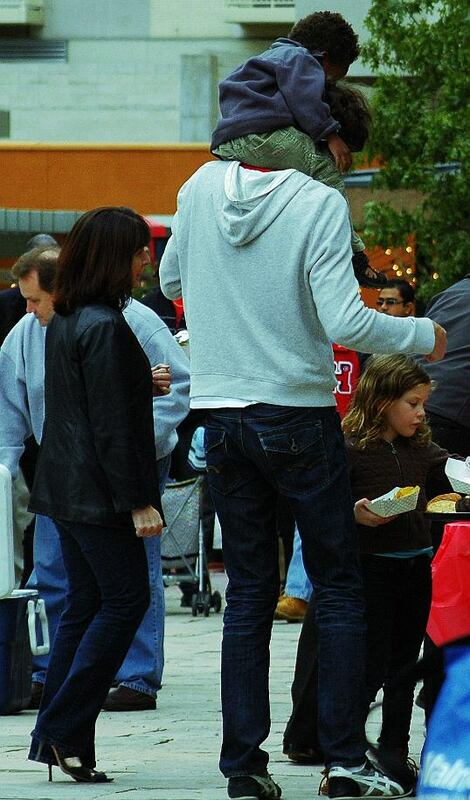 We spoke to the folks for a minute afterward, but they had to get set up for the judging of a taco contest. 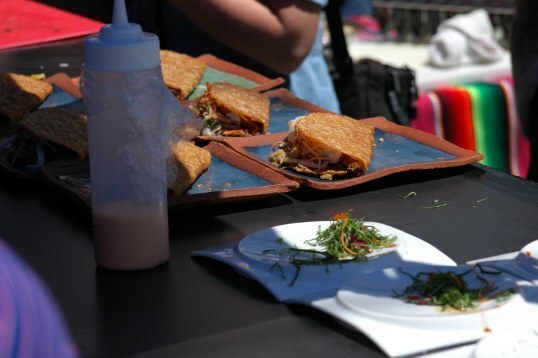 We walked out the side door where a handful of local chefs were preparing their contest entries – they looked wonderful. A long ways from Taco Bell – the gateway drug.